Today I went to the local Pistol range to get some practice and to work on my Marksmanship skill in 13 skills. The weather was not really the best to go to the range, with torrential rain coming in at all angles, however I needed to go. I arrived at 9:45am to assist in setting up the range, yet I was too late and due to this I missed out on joining in the first detail. I spent the 30 minutes waiting and chatting to a few of the regular shooters. One of them owns a gun shop, or something like that, and he always has interesting stories about customers and weird guns. Today he gave me some advice on how I can get my Baby Eagle 9mm pistol repair, which was most welcome. Half an hour later it was my turn to go to the firing line. We had set up some rain covers to protect the pistols (and the shooters) and once we were all ready we commenced the Classic Action match. I shoot this match with a Silver Ruger 22/45. It was the make of pistol I used when I was trained in pistols so I am very familiar with it. 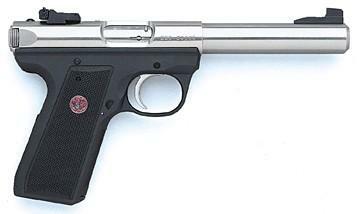 An image from the Ruger website.